I thought the 100th post of the blog should be dedicated to the father of our nation - Mohandas Karamchand Gandhi, known for many decades now as Mahatma or the Great Soul. This is the photograph of a landmark that depicts the Mahatma leading the Dandi march against the British tax on salt. The man had, single handedly, altered the course of the Indian struggle for freedom from a political movement to a mass movement. first of all, congrats & great going! congrats priyanka for your achievement. wishing you the very best for all your upcoming endevours and hope you keep up your good work. 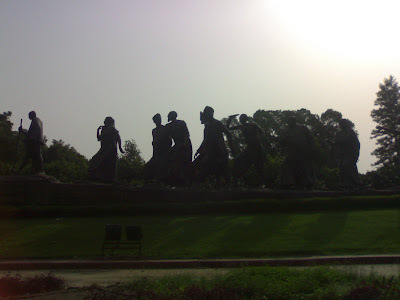 enjoyed your Delhi photo diary so far and looking forward for many more interesting photos. Beautiful silhouette...congrats on your 100th! Haven't been to your blog for a few days - I know what a century feels like, I got there 3 days after you did!